We’re all about creating an inclusion revolution here at Best Buddies, and you’re a part of it. Walking is how you show it, and fundraising is how you grow it. You, yes YOU, can move our mission forward, and we’re here to help – that’s what friends are for. 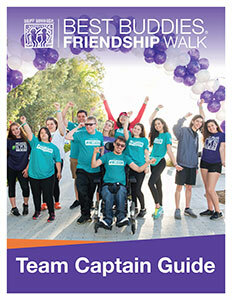 First step: get in on inclusion by raising $50 to earn the official Best Buddies Friendship Walk t-shirt. You raise funds → we reward you. *Limited quantities available. Participants are eligible to redeem one item at or below the level achieved. Incentives certificates will be distributed three weeks post event via email. Please add thanks@bestbuddies.org to your address book for easy delivery. Please note: Only donations made directly through your Best Buddies Friendship Walk donation page will count towards your fundraising goal. Donations received through 3rd party platforms such as facebook fundraising, gofundme.com, etc will not show in your fundraising totals. Upload a photo: don’t be the person that buys a frame and keeps the stock photo in there. Pick an image that means something to you. Find your connection: Why are you walking? Why does having friends matter? Who’s your best friend and why? Whether you’ve been involved in Best Buddies for 20 years or you found out about us yesterday, friendship means something to you. Find your story and tell it – people will listen. Make a list of who you know, ask them to donate, and then ask them to ask their peeps to do the same. Did you follow that? Good. Family & friends: Start with the people who love you – Mom, Dad and your BFF (you can call us Captain Obvious). Then move on to fun uncles and long-lost cousins. Send snail mail: Yes, that’s still a thing. Sending old-fashioned letters really works. Just make sure to include a link to your fundraising page or an address where your supporters can send a check. Fire off some emails and texts: This whole technology thing is great – it’s the fastest way from Point A to Point B. Get your fundraising link to your network as easily as possible. Tell people what you want: People aren’t mind-readers (probably), so be specific. Let them know exactly how much you want to raise and by when. Be grateful: This should be a given. Every gift deserves a thank you. Be prompt and sincere with your appreciation. Ask your company about their matching gift policy. You could double your donations. Have a hook: We’re all 4 year olds on social media – it’s hard to keep our attention, and we prefer picture books. Captivate your audience with an image, video, or even creative hashtags. Showing is greater than telling, and your words are far more valuable when your reader actually sees them. publicly: Saying thank you on social media can be a little different. Be sure to tag your friends as you appreciate them – not only does it feel good for your supporter to be recognized publicly, but you also have a chance to inspire other donors. consistently: $5 or $500, every donation matters. Recognize gifts as soon as possible, and always personalize each thank you. 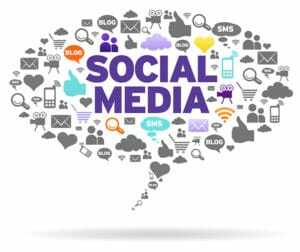 creatively: With social media, even your thank yous can be used to bring more attention to your campaign. Some successful fundraisers have thanked their donors with individualized GIFs, while others have promised to share personalized videos for every donation. Think about your network, and find what works for you. mission-focused: Remember why you’re raising money for Best Buddies, and remind your contributors why their gift matters. You may have a great pitch, but it’s hard for people to donate without knowing where to do so. Send your potential donors directly to your fundraising page. Take a look for ideas on how to take your team to the top!